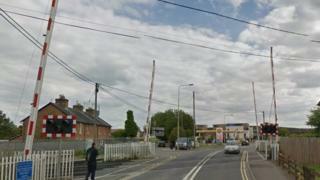 Businesses in Bicester say trade has been affected by the closure of a level crossing. Part of London Road - the main route into the town - has been shut since 10 August for barrier works. Some firms claim there has been a drop in trade with residents now opting to shop elsewhere. Network Rail (NR) said the crossing would open by 11 October and there were no plans to permanently close the crossing. However, local taxi driver Jaffa Hassan said signs in the town stated work would continue until 22 October. He said the work was costing him fares, as people were not willing to pay the extra fare to divert around the closure, and described peak times as "gridlocked". Ben Jackson, president of Bicester Chamber of Commerce, said traders had noticed a "drop-off" in the number of people shopping in Bicester. He also said some residents were now shopping in Aylesbury, Buckinghamshire, claiming it was "quicker and easier". NR said the crossing was being upgraded in preparation for a new service that starts later this month from Oxford Parkway through Bicester to London Marylebone.